Dream matte mousse, green eyeshadow and foundation lips are all beauty trends that I'm happy that I no longer wear on a daily basis. This look is more of a casual one. For work and for days out, it's a simple, but also a little bit glam. It's such an easy look to take from day to night, just add a pop of colour with your signature lipstick. After applying my base, the first product I use in my everyday makeup routine is the Rimmel Wake Me Up Concealer. This is my favourite concealer that I've ever tried and it definitely helps making me not look like a zombie in the morning. It's a quite thick consistency, therefore perfect for covering up any dark circles or aggressive blemishes. This foundation can do no wrong in my eyes. After having my foundation matched terrible by Estee Lauder in the past, even though I heard so many amazing things about the foundation, I was completely put off by the brand and the foundation. But, as I started to read more and more reviews, I decided that I needed to give it another try. I quickly realised the Double Wear Foundation was a bit heavy for me, but the cushion stick was lighter. It's great for everyday wear, the longevity is amazing and I love the overall finish. I wear this everyday without fail, it's a natural foundation, but makes me feel confident in my skin. If you need some more information about this foundation, please feel free to read my Estee Lauder Double Wear Cushion Stick Review. This eyebrow pencil is the perfect product to help you achieve natural looking brows. With a brush on one end and the pencil on the other, it's a great 2-in-1 product that you can take anywhere. It makes doing my brows easy, as the product gracefully glides across my brow, making them look naturally fuller, but also giving them some shape. This is another product that I could honestly rave all day about and I did, in my review of the Bobbi Brown Eyebrow Pencil. I've been pretty much obsessed with this bronzer since I've had it. I've tried a couple of bronzers in the past, but being a pale girl, when I find one that suits me, I will cling on to it with everything I have. The Seventeen Instant Glow Shimmer Brick is that bronzer to me. It's quote a subtle bronzer and leaves your cheeks with a natural healthy glow. Again, you can see my full review of the Seventeen Instant Glow Shimmer Brick here. This is my favourite highlighter of all time. Easily. After applying my bronzer I simply run this along my cheekbones and under my eyes and blend in in using my flat brush. It instantly brightens my face. Again, it's quite a subtle product, highlighting areas of my face, but without adding any shimmer or glitter. It helps give my face a natural, healthy glow. To help take this look day to night, I simply add a shimmering highlight product to my cheekbones to make them pop. I love felt tip eyeliners. I won't buy any other eyeliner as I know and understand that this kind of eyeliner is for me. Although I have quite a lot of felt tip eyeliners, the Bourgois Liner Feutre is what I use on a daily basis. There is a couple of reasons for this, but the main one is that the tip is so thin, making it easy to make a thin cat flick on the eyelids, which isn't too thick or over the top. I love having a thin cat flick on a day to day basis, as I just feel really bare without anything. It's a perfect look for work too. There's nothing quite like finding a mascara that simply gets you. 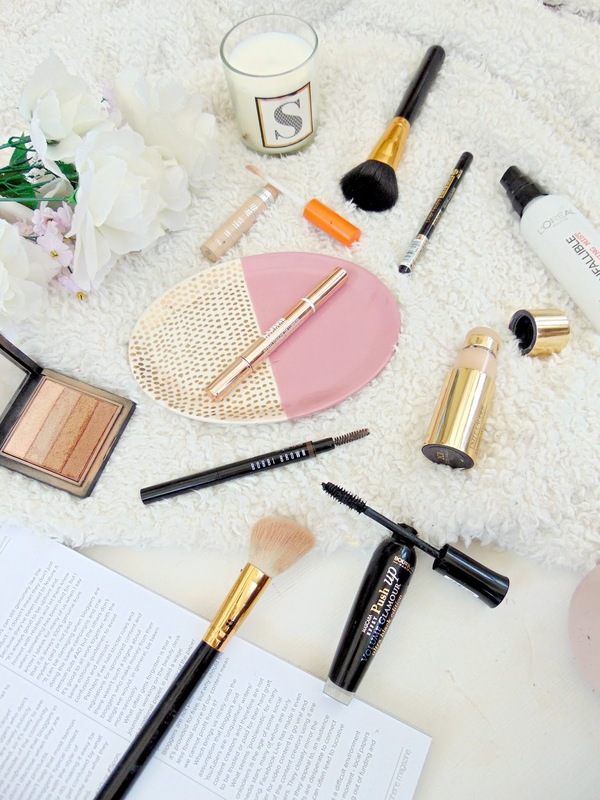 I feel like the Bourjois Push Up Glamour mascara works well with my lashes as I only need a couple of coats for everyday for them to be voluminised, lengthened and look fuller. This mascara is a great one for the evening too as with a couple more layers of mascara, it's easy to create doll-like lashes, making your eyes look more glamourous. My everyday makeup routine would not be complete without a spray of the L'Oreal Infallible Fixing Mist. A few sprays of this and my makeup will stay put for the entire day. It's a lifesaver and I don't know how I ever coped without a fixing mist. Are any of your everyday favourites in this list?